While I enjoyed Raghuvaran B.Tech on my first watch, I never truly appreciated the perfect storm of marketing, storytelling and heart that made it a social phenomenon until I caught a whole host of reruns of the film on TV. When VIP 2 was set to hit the screens, I asked myself what story the filmmakers could have in mind to elaborate on that pitch perfect first film. Raghuvaran has a job, a wife, made peace with the death of his mother, taught the corporate rich kid that talent is more valuable than money and so on. With all bases covered by the original, would VIP 2 fall victim to the dreaded disease sequelitis by repeating its themes and arcs like a Singam film or would it rise above the swamp and be the standard-bearer on how sequels need to be made? VIP 2 is a sloppily put together, unfocused mess of a film which is moderately enjoyable owing to its writer/star's unyielding charisma and acting chops. Explaining the plot of the film would be one the biggest undertakings I've had in recent memory. The film's many B-plots include everything from launching one's own start-up to taking on the prejudice of a rich businesswoman to stopping illegal theme parks from being constructed to losing a job to dealing with one's nagging wife and so on and so forth. The multiple B-plots which try to serve as many demographics as possible fatally cripple the film in one very important aspect of screenwriting - the movie has no primary story or a reason to exist. It fights against all odds to justify its presence on the silver screen with a barrage of formulaic elements while the unadulterated honesty of intent Raghuvaran B.Tech had is wholly lost under said barrage. Dhanush, whose previous work on the page was the surprisingly refreshing Pa Paandi, pens a story with a host of admittedly humorous dialogues but not many bones to carry said meat as the movie rarely focuses on anything substantial. There is a distinct lack of flow from scene to scene as plot points are left out to dry with no discernable effort to weave them into the overall narrative until the third act calls for it. Antagonists come and go, resolutions are haphazardly stitched together, and Raghuvaran the character acts as a saviour to one too many people while this film forgets to adequately illustrate his newfound competence and drive. While Dhanush's screen presence is ever welcome owing to his man-of-the-people reliability and durable charm, I had a sinking feeling in my stomach (I maybe on an island here) when I first heard that screen legend Kajol was being cast as the primary antagonist of this film. There is something laudable about ambitious casting, and Kajol is an actress who is highly capable of pulling off most roles with aplomb, but my fear of this being an exercise in gimmickry used to mask serious deficiencies in storytelling were laid bare within the first 20 minutes. While the original had an entertaining dichotomy between the protagonist and the antagonist with both starting their lives on the work force with varying circumstances but similar goals, the sequel fills itself with one contrived scene after another to justify its antagonist's motivations and actions. While I more than appreciated the intent behind the writers choosing to draw a line in the sand by having a female antagonist (which makes the approach fresh), and I more than liked the climactic resolution, Rahguvaran seems a tad too overpowered for most of this to not ring hollow. As a sidebar, could filmmakers be bothered to come up with more creative names for their fictional companies? No? Okay, moving on. Amala Paul and Samutrakani who played pivotal characters who added to Raghuvaran's primary conflict in the original are relegated to the roles of incessant nag and not-so-wise old man, respectively - a shame for a cast of characters who well and truly induce the comfort and warmth of one's own home life. With Soundarya Rajinikanth at the helm, you would not be at fault to expect a film with a certain degree of technical finesse. Her previous work 3 had a distinct style to it and was all the better for it. But VIP 2 is aggressively bland with its visual packaging. The cinematography is flat throughout and a few slow-mo fight scenes are in no way redeeming. The excellent fight choreography and spatial awareness the original had are sorely lacking, and when these flaws are combined with a loud hip-hop infused score by Sean Roldan, the recipe for a forgettable venture has been executed to a tee. The film uses snippets of the score from Raghuvaran B.Tech from time to time, and those moments act as stark reminders as to how much of a drop off in quality the film currently playing on screen is. Anirudh Ravichander, your handle on the score is truly missed. Would this movie have played better if it weren't for that first one? Through all these downsides, the movie is rarely boring. For the lack of a better phrase, there are just way too many things on screen to leave an audience unengaged. The film's plot-hopping antics make for entertaining viewing even though it lacks a sense of deftness. Its self-awareness combined with its effective self-deprecation (those mother sentiment lines are pure gold) make for popcorn entertainment which is funny as you watch it but will quite easily slip out of the other ear as soon as you step out of the cinema. 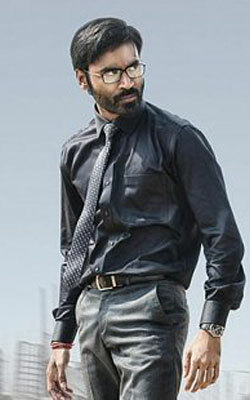 Films starring Dhanush are rarely unwatchable. When compared to his contemporaries, Dhanush is one of the very few big name actors who take chances with their films (both acting and producing) while trying to essay universally relatable stories. He was one of the creative minds behind the universally loved Raghuvaran B.Tech, and India's 2016's Oscar contender, the poignant and heart-breaking Visaranai. The man has proved his mettle as a producer, actor, singer and writer, and most recently, as a director. This creates a swell of expectation when you see his name stamped on a film. But even Dhanush cannot avoid duds in his repertoire, and VIP 2 is his most recent. Finally, someone who loves Raghuvaran BTech. as much as I did! Definitely a 10/10 film, if not more. I will never stop bitching about the 5.5 rating that was assigned to it. Great review, TJ. Where does FullHyd manage to get these gems of reviewers? Everyone is knocking all their reviews out of the park. Was going to point out that 3 was his wife's film but seems like Josh really hated Kochadaiyan. Looks like an engaging train wreck of a film. Maybe I should stay away from this just to make sure I continue to view Raghuvaran on a pedestal. How can you make Amala Paul, the woman who was the heart to Dhanush's soul in the original, a nag in the film? And when did Samuthrakani become unwise? Should've retained their best attributes. Hopefully, Paisa Vasool is going to be good! Just kidding, can't wait for the review. Although I wonder if TJ, being the newbie, will be forced by the editor to...gulp...sit through it. It'll be like the suicide squad on GoT trying to get the wight. Sure, we want to see the wight, but do we want to lose a dragon in the process? On behalf of my brethren, I appreciate the kind words.This film while not bad is nowhere close the original. It is just such a forgettable affair. And yes, the one time I didn't do my double check and trusted my memory is the one time I get a fact wrong #fakenews. Did not even know Paisa Vasool was a film until I read this comment. Looked it up and sufficed to say I am shuddering at the thought of it. If I do end up watching it, hopefully, I am pleasantly surprised. 3 was Aishwarya Rajnikanth's film, dude. This one is Soundarya Rajinikanth. The lady who made the worst Rajnikanth film film ever - wait, it wasn't even a film - Kochadaiyaan. My personal life was getting to shambles around the time that non-film released. I eagerly went for it hoping for some semblance of Rajnikanth induced comfort and I still remember feeling like I was losing the grip over my life as I watched my thalaivar's cold lifeless eyes. This man meant joy to me and she robbed me of that joy. Oh snap! Thanks for pointing that out Josh. Must have gotten them mixed up. And my god Kochadiyan, no human must have to sit through that horrid film. That film is so deep in the uncanny valley that it scared me. Everything looks so wrong and that story is god awful. That film might be Thalaivar's worst even Linga is redeemable in a way. I like the bit you've written about Dhanush. I've been his fan since Aadukalam and am in awe of his production choices (Seen Tharangam's trailer yet?). But I feel he's unnecessarily placing premium emphasis on the star factor with Maari and VIP2. I feel he needs to seek out the talent that is gravitating to Vijay Sethupathi. You watched Linga a second time after seeing him kick a bomb into a helicopter!! LOLS.. itsThalaivar's appeal I guess. Man Vijay Sethupati was so balls to wall awesome in Vikram Vedha even if the movie kinda flounders a bit. That movie entertained me to no end. And aadukalam another 11/10. So bloody good. Checked the Tharangam trailer too, looks interesting and ambitious in the same vein. fullhyd.com has 700,000+ monthly visits. Tell Hyderabad what you feel about VIP 2!